I love pizza. My favourite toppings are mushroom, pineapple, green olives. Hit them with a couple of splashes of hot sauce…delish. I get teased a lot about those toppings, but seriously! The saltiness of the green olives combined with the sweetness of the pineapple. The mushrooms rounding the flavours out. So taste-bud good. 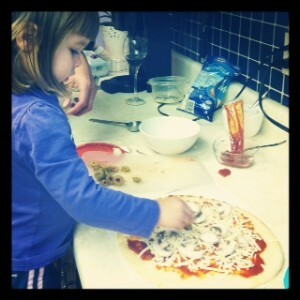 We make pizza in the Gallant household almost every week. I love it because the prep work isn’t all that much, and Sweet Girl loves it because she gets to help make the pizza. We three each have our favourites. Mine as mentioned above. My husband is a pepperoni fan, and Sweet Girl goes for plain cheese. As a kid though, I didn’t really like pizza. It was okay but never something I clamoured for. Until I was 16. That’s when I had my first slice of vegetarian. Don’t know why it took me so many years to try veggie pizza except that my family definitely are meat-on-pizza kind of people. I guess I never considered anything else. My cute pizza chef laying those mushrooms down so carefully. But having that veggie slice was like an epiphany. Oh! So that’s why pizza always seems meh to me. I don’t like meat on my pizza! Fast forward a year and now I have my first serious boyfriend. He was a nice guy. We hung out a lot which meant we also ate a lot of meals together. He was also a meat pizza kind of guy. And for whatever reason, it was a big deal to ask for part of the pizza we shared to be meatless. Instead of standing my ground and sticking to my veggie-pizza-eating ways (or foregoing altogether) I just went with whatever he wanted. It’s not like he ever said no, you can’t have what you want on your own pizza. It was more like it was a big inconvenience to make the pizza order complicated. With half of it meat, meat and more meat, and the other half one or two veggies please. And of course it was more expensive to order two pizzas so…I said it didn’t matter. Here’s the thing with that kind of compromise. It’s not really a compromise is it? There’s no give and take there. And while I’m not bringing this up as a statement about my first relationship, I am powerfully aware of what it says about the kind of person I was at the time. I was a pushover. In more ways than a discussion of pizza toppings conveys. I had family who bossed me around. Friends who bossed me around and a boyfriend who in some subtle ways did the same. But truth – I let this happen. It took me years. Years to recognize that no one should be criticizing me or making decisions about my life except for me. That I am the best person to understand what is right for me. Be it a life goal, what to do in my free time or what the hell I want to put on my pizza. Obviously some of this self-discovery comes with maturity as we navigate through adulthood. But some of it is something we should have an understanding of at an early age. I don’t want this to be a later-in-life discovery for Sweet Girl. To lose herself so deeply in the opinions of others that she fails to speak her own.To finally do it and have to cut people from her life because of the push back. To somehow be made the bad person for wrestling control of her destiny. Nope. I want her to be firm in her knowledge of self. Her identity. From her constant demands for cookies, it would seem at this point in her life she definitely knows what she wants. Nope, she’s not shying away from expressing herself just yet. Fingers crossed it stays that way. That seems like one of the tougher jobs as a parent. Hopefully your awareness will better prepare you for the time when you will need to do a little digging to help her discover what it is she wants and give her a little push to demand it – not in a demanding way, of course. Speaking of strange taste combinations – I like peanut butter and green olive sandwiches. So there! Hey Erin, you’re totally right. Need to be mindful of when to remind her and when reminding isn’t needed. Oh, and peanut and green olive sandwich you say? I’m so going try that!